When a quote with an exclamation point ends a sentence -- "Revere warned that "the British are coming!" -- is a period still required outside the close quote mark? In obituaries, surviving children, for instance, often live in different cities in the same state. Do you have to list the name of the state with each city or, if the state is the same as the deceased's, can you just list the city and let people assume it's the same state as deceased's. Adding the state names adds a lot of commas in long lists of names. Do it as you describe here. Is a comma needed after "say" and quotation marks around "WOW" in the following sentence? Our low prices will make you say "WOW!" Thank you. The comma is optional. You don't need it. The quote marks are optional too, in this case, but I'd use them. Is it Pre-Civil War or pre-Civil War when used in a sentence? Would you leave "free-range" hyphenated in the following headline: Benefits or raising chickens free-range. Yes, I'd hyphenate it. It could initially be read differently without the hyphen, as if the benefits or the chickens are freeing a range. Would you hyphenate at-will associate? What about in the case of the company's policy of employment at will? I'd make it as you have it: An at-will associate; the company's policy of employment at will. What pronoun does AP Stylebook use to refer to companies and other legal entities: "it" or "they"? "Microsoft is one of many cloud storage options; it has many competitors..."
"Sealy was founded in Sealy, Texas, but they moved their headquarters several times, most recently to Trinity, North Carolina." We use it in those cases. Hello. Two questions: In financial stories, would you say "the week ending April 5" or "the week ENDED April 5"? And in the construction "ZY Corp. repeated earnings increased year on year," would you hyphenate "year on year"? Thanks. We prefer the week ending, though the week ended sometimes sneaks in. I'd hyphenate year-on-year. What is the proper hyphenation rule for "fixed income relative value?" I have seen "fixed income relative value" written with and without a hyphen in news publications. Assume it should be "specializes in fixed-income relative value" and "the fixed-income relative-value strategy"? Use of the hyphen is far from standardized. It is optional in most cases, a matter of taste, judgment and style sense. But the fewer hyphens the better; use them only when not using them causes confusion (loose-knit group, but tax code changes). Think of hyphens as an aid to readers’ comprehension. If a hyphen makes the meaning clearer, use it. If it just adds clutter and distraction to the sentence, don’t use it. I'd say that as a noun phrase, fixed income relative value is fine without the hyphens. It might also be fine with no hyphens as a modifier. But since there are a lot of words there, you're better off hyphenating as a modifier the fixed-income relative-value strategy. Again, though, others may do it differently and that doesn't make them wrong, in this case. Is it correct to say a patient is diagnosed WITH a disease, or a patient is diagnosed AS HAVING a disease? Either is fine in common usage. If you're writing for persnickety readers, you might opt for the second option. Accepted or not and if so what is the AP preference ? It's not a term we would use, with or without the hyphens. Would you use numerals or spell out 2 1/2-year experience? Do it as you have it. If you have a sentence: Blank blank is always where you need us most-close to the place your family calls home. Is is proper to use a dash or comma in between most close? A dash or a colon. Note, what you have there is a hyphen. Blank blank is always where you need us most – close to the place your family calls home. Blank blank is always where you need us most: close to the place your family calls home. Now that the hyphen rules have been updated, is it still family-owned or is it family owned now? I'd use the hyphen for clarity. (The hyphen rules are the same as always, with a few exceptions. We just added more explanation and examples). Savannah will attend the North Carolina State University Wolfpack Women’s Basketball Camp from June 9 – 12, 2019. It's from. Also, AP style uses a hyphen for ranges: June 9-12. When writing the title of an article, should you capitalize all words four letters or more, such as "from" or "with"? For composition titles, yes. Here is the entry. These guidelines apply to titles of books, movies, plays, poems, albums, songs, operas, radio and television programs, lectures, speeches, and works of art. If you're talking about the headline for a news or feature story, AP style is to capitalize only the first word and proper nouns. Should the title, Customer Service Representatives, be lower case in the following sentence? Since its inception, the chat feature has rendered significant results, offering members the ability to chat online with Customer Service Representatives in real time, for faster, more efficient service. Those words should be lowercase when standing alone. In the sentence below, should the word real time be one word, two words, or hyphenated? Two words, as you have written it. Copy editing a research-based story and this is in a quote: Should it be dataset or data set? With many beauty products focusing on being nontoxic and all-natural now, we're coming across nail polishes that are labeled as such. Basically, for polish, safety is discussed in terms of 3-free up to 10-free, etc. It means the polish is free from the top X number of the worst chemicals typically found in it. My question is: Would we in the magazine business (we follow AP) ignore the industry style and write three-free, eight-free, etc., up to 10? Thank you for your help! I'd go with the numeral in this case: 3-free, 8-free. In a sentence such as this: "This certificate is issued by the State of Illinois," does "state" have to have an initial cap? 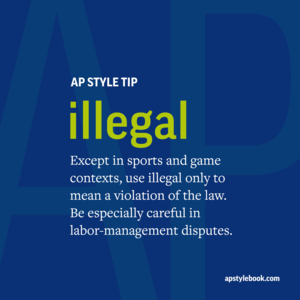 Not in AP style. State and local governments tend to follow their own style and use the capital letter there. But in AP style, we don't. Would "Well-Lived" be hyphenated in this particular construction? It's simply a product tagline (not a complete sentence) that says: Life Well Lived. I'd recommend hyphenated in that use, just for absolute clarity. Without the context of a full sentence, it could be a little confusing without the hyphen. At least, it could cause the reader to pause for a split second to think about it. Is there a Life Well? Is it like the fountain of youth? Like that. When you have a dateline, say from Boston, but your lead mentions an event, like a labor strike, in three or four different states, to avoid confusion wouldn't it be better to include the state, with the mention of a lesser known city or town in Massachusetts later in the article despite the general rule that it is not needed for cities in the same state as the deadline. You might be quoting a worker in Hartford, Connecticut, in one paragraph then one in a small town in Mass. and then move on to a worker in Rhode Island. It would be reasonable to do that in such a situation, if there's a possibility for confusion. As with everything, style is flexible; it can and should be tweaked to meet the needs of individual situations. This particular situation doesn't come up all that often, so no one has ever seen a need to spell it out as a one-off exception in the general guidelines. After using a full title on first reference, if I use an abbreviated title on subsequent references is is capitalized? Example: Also included is “A Buyer’s Guide to the Cuteness of Gerbils” that issues grades from A to F on gerbil cuteness. Read the full report and download the buyer’s guide (or Buyer's Guide) at cutegerbils.com. Best question all day! Or at least, best use of squirmy animals and I needed that right now. Lowercase buyer's guide on second reference. I'm so disappointed that cutegerbils.com doesn't actually exist. As an aside: Chuckanut.